... well I might have been a bit late again. 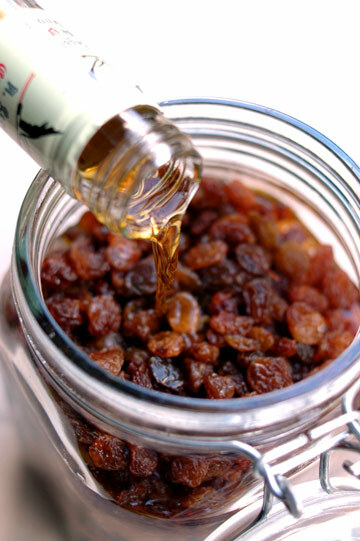 I have been lagging behind in blogging many recent developments, but here I'm making this a note to self; last week I got around to soaking dried fruits in liquors in preparation for making fruit cake for Christmas. Last year I didn't need to do this as I had some leftover mincemeat from the year before, but well, this year, I had nothing, so I made it from scratch. 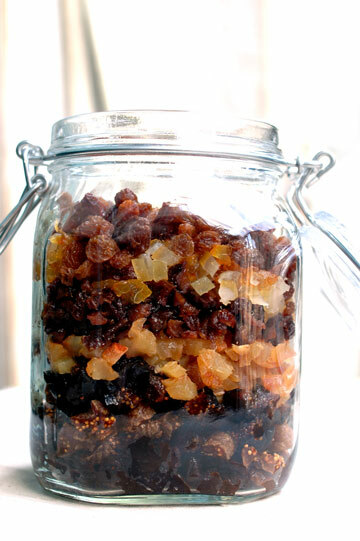 That said, I decided not to make traditional mincemeat this year. Instead, I just soaked fruits directly in liquors, without adding sugar or fat, which is what I used to do before. 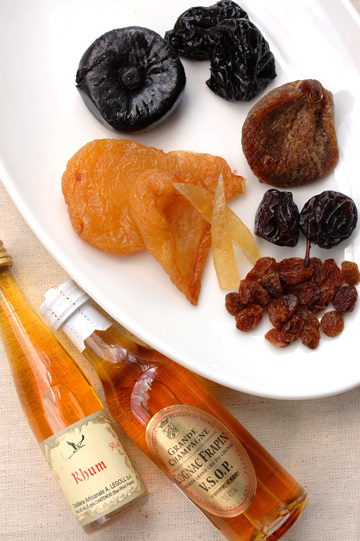 This time I had semi-dried black figs, large white figs, prunes, mirabelles (a kind of plum), and pears, all of which are from France. I also had some sultana raisins and candied zest of bitter oranges from Spain, plus candied zest of lemon for which I don't know where it is from. 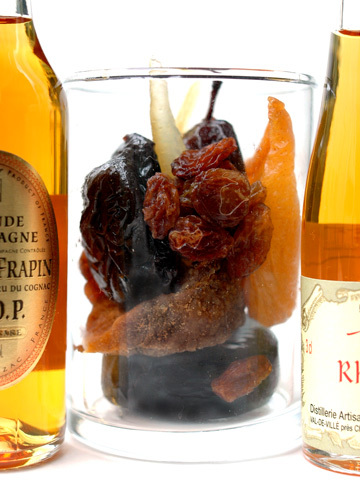 I chopped up everything (except raisins), threw them altogether into a large jar, and poured some French rum and brandy - from A. Legoll and Cognac Frapin, respectively. I seem to have soaked something like 2.5lb of dried fruits in total in 10-12 oz. of rum and 3 oz. of cognac. This should be a plenty for this year's cakes, and probably for the next year as well. I am so inspired to do this! 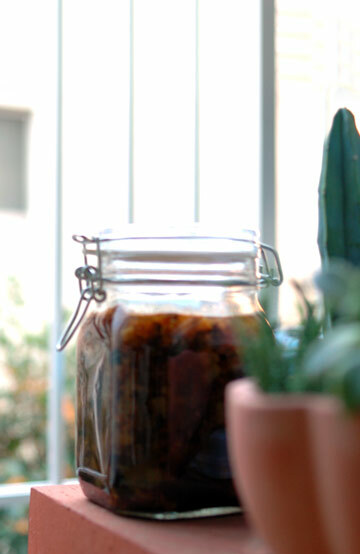 I am rushing out of the office in 2 hours to get a jar and dried fruits. My brother LOVES fruitcake and he'd have his little socks blown off if I made him a proper fruit cake. You must post a full reciepe when you have time. Thank you so much for your inspiration!! AH, I'm sorry, I found the link after all. http://www.deliaonline.com/cookery-school/how-to/how-to-make-a-christmas-cake,17,AR.html Thanks again! and ur photographs are really great!! it makes the food even more mouthwatering ..
What kind of camera are you using? Your photos are always AMAZING! I have never corresponded in such a fashion but I was very inspired by some of your recipes. So, I shall give it a try!I am a Tea Student, studying seriously in the Urasenke tradition.I also have finally begun my Japanese speaking, reading and writing lessens and am in bliss! I have searched in vain for molds to make wasanbon and ohigasi along with recipes. I make all sorts of little o kashi but would SO love to find information on the above. Can you help me in anyway?